Click the button below to add the LX 470 - Interior LED kit to your wish list. Add back up lights for 1998-2003 models? Add back up lights for 2003-2007 models? This produce was ordered 2/23, it's never been received. I repeatedly tried to get updates on it, with zero response. I'm very pleased with this product thus far. 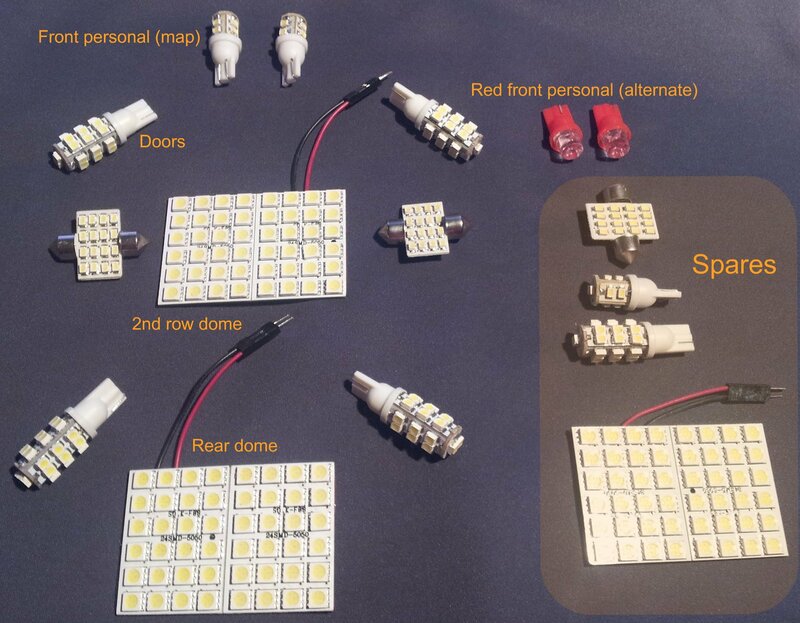 Please note, if you want to change out both your front map lights and license plate lights, you will need to purchase one extra white map light. The included red map lights can be used in the front, leaving the two white lights for the license plate. Night Vision set to "Super-Nova"
I also bought the reverse lights...big difference at night, especially with the tint. My reverse camera likes them too. I noticed that the door lights had just one wire folded over the tab, so I had to play with them a little to make sure they had good contact. The bulbs I took out had a little loop on the tab so made more firm contact. I would love to be able to buy some LED bulbs for the exterior parking/marker lights at the corners of the vehicle. My thought is that if these were LED, I could more safely leave the parking lights on for longer without concern for the battery since they are low-power LEDs. Received product very promptly. Installation was a breeze for all four doors, two dome lights and four map lights. Will need nimble fingers. Be mindful of polarity prior to reassembling fixtures. Far superior to standard bulbs. Kit is good quality and installs easy. Great for camping etc when there are no other lights around. The Wife loves them too. The only thing I noticed is that the color temperatures are very slightly different between door lights and dome lights. Really not a big enough difference to matter. Great product! Even the wife loves it! Great kit. Even comes with some spares. Easy to install. I highly recommend this for everyone with an LC or LX. The kit I purchased is great. Because of a small difference between the LC and LX470 the bulbs I received would not fit. No problem! PFRAN shipped smaller bulbs out the next day!!! VERY bright LED's!!! easy to install work great! Very Well made and complete set. Install on a 2000 Lexus LX470 was easy and quick. Newly installed so I will have to comment about durability later but as of now very satisfied.